Resume Presentation— A resume is a summary of your experiences and skills relevant to the field of work you are entering. It highlights your accomplishments to show a potential employer that you are qualified for the work you want. It is not a biography of everything you have done. This workshop will cover the basic ingredients in a resume, what information to list to catch an employer’s attention. As an interactive workshop, students will edit a resume. Students MUST bring a copy of their resume to attend this workshop. You will not be allowed into the workshop without a resume. Don’t worry about it being perfect, bring what you have. 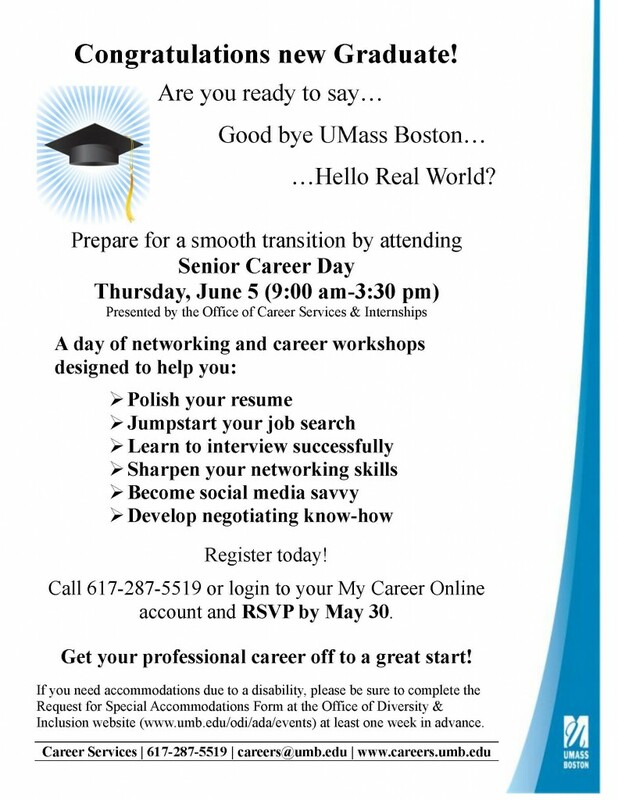 Sign up in advance under “Career Fairs & Events” at https://www.myinterfase.com/umb/student/ STUDENTS This is a 1 hour event. Please plan a 15 minute window, at both the beginning and end, to ensure travel time and your ability to stay for the entire event. MAP credit attaches for full attendance and engagement in the session only.